Here at The Spires we are extremely excited for the opening of our new property in Edinburgh because as Scotland’s capital, it tends to be the Scottish destination that everyone tends to think of first. Aided by all the history, beauty and entertainment that it has to offer, it is no surprise that Edinburgh is frequently seen as a top European Destination and as it holds the world’s largest arts festival in August, it is also no surprise that Edinburgh holds a rather prominent position on the cultural arts stage. Therefore, it is only to be expected that of all the places in Scotland, Edinburgh would most certainly aim to be an extra in many a Bollywood film. 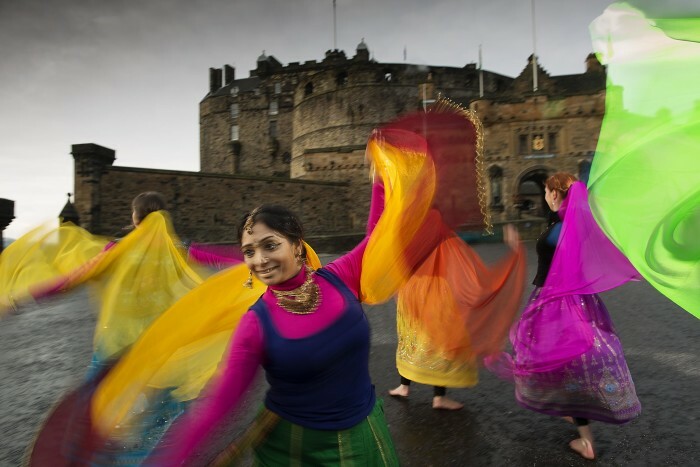 Consequently, Edinburgh should be a major stop on your Bollywood journey because not only has it been showcased in many a Bollywood film, but it was the first location where the VisitScotland Bollywood map was even unveiled in Scotland! Edinburgh did not just help to put the VisitScotland Bollywood map on the well, map, but it also was a critical location in Bollywood’s breakout into Scotland itself. One of the films that really began the Bollywood movement to Scotland was Main Solah Baras Ki (Sweet Sixteen) where Edinburgh really managed to score itself a role. In Main Solah Baras Ki (1998), an Indian director is looking for a female actress to play the leading role in his new role. After failing to find anyone in India, he comes to the UK which ultimately results in a love story between a young actress and the director. Many an iconic Edinburgh location was showcased in Main Solah Baras Ki from Edinburgh Castle, Princes Street, Calton Hill, The Mound, The Royal Mile, Holyrood Park, Princes Mall, Waverley Station, Scott Monument and Princes Garden. The film in itself was pretty much a walking tour of Edinburgh, thus reflecting how it is a good movie to generate some Scottish travelling inspiration! Some particular movie moments to reflect on and live out is when Sabrina played the tambourine and Scotland’s favourite instrument, the bagpipe, on the Royal Mile and at St. Giles’ Cathedral as well as when Sabrina bought some flowers on the roof-top plaza of Princes Mall. Kuch Khatti Kuch Meethi (2001), afforded the featuring of many similar sites but a particular special moment was where famous Bollywood actor, Kajol, performed a salsa by the Scott Monument! Aarzoo (1999), directed by Lawrence D’Souza, was a Bollywood movie prominently filmed in the UK and was a film that revolved around a doctor’s daughter becoming entangled romantically with a man whom he does not like and how he conspires to get her together with a childhood friend of hers. As is the norm, it is a film heavily about love! Many a site that was featured in Main Solah Baras Ki is also featured in Aarzoo from the infamous Edinburgh castle to Princes Street. However, some new sites such as Edinburgh Zoo, Gladstone Memorial and the Scottish National Gallery also make their Bollywood debut. Bollywood movie moments involving Edinburgh could also be found in Yeh Hai Jalwa; a 2002 Bollywood comedy translating as ‘This is Magic’ which focused on a young man, played by the renowned Salman Khan, seeking out his long-lost father in the UK. Yeh Hai Jalwa included a romantic scene on Princes Street; a saxophone being played outside the Scottish National Gallery and a rooftop dance near The Balmoral Hotel. Just a normal day in Edinburgh! Even in recent years Edinburgh has still managed to be a critical setting for Bollywood movies as can be seen in Mausam (2011), a romantic drama where an air pilot falls in love with a younger woman. It was made by iconic Bollywood star Pankaj Kapoor showing how Edinburgh can still draw in the big names. Special moments included a night-time carriage ride in the Anchor Close area and many a unique Edinburgh location, from the Grassmarket to Usher Hall where the lead character and his friends went to see a Mozart recital, were showcased amongst all the standard (but always beautiful) shots of Scott Monument and The Mound. Melville Street and Newhaven Main Street even were used as exteriors for where the lead character lived. If you are a really eager fan and want to stop by and eat where the characters did, the Beehive Inn is the place to go! The formidable Forth Rail Bridge also made a sneaky appearance as it did in Yeh Dil Aashiqanaa (2002) and Main Solah Baras Ki. The connection between the VisitScotland Bollywood campaign and Edinburgh is particularly strong because it is being sponsored by Quatar Airlines, the airline that from May 1st, are running daily flights from Edinburgh to Doha making a Bollywood adventure out to Scotland even more accessible. In particular, make sure to come to Edinburgh about August-September time when the Edinburgh Mela Festival and the Edinburgh Military Tattoo are holding a massive Bollywood Dance Extravaganza which will see 60 dancers from India and Scotland come together in celebration-it is not to be missed! Consequently, it is clear that there is no shortage of Bollywood movie nostalgia to be lived out in Edinburgh and that no Bollywood adventure would be complete without a stop-off in Edinburgh. Coupled with Edinburgh’s Airport and the transport links to Aberdeen and Glasgow, it may even be the perfect place to begin a summer of Bollywood.